Even though I’ve seen it for the first time ever in the past couple of days, I’ve had a relationship of sorts with CHILLY SCENES OF WINTER that goes back about 30 years or so. Let me explain. Way back in the 1980’s I discovered and fell in love with three fascinating and important books: the “Cult Movies” series written by Danny Peary. In these three books Mr. Peary wrote the most passionate, informative, entertaining and insightful movie reviews I’ve ever read. Reading his reviews was like talking about these movies with an old friend, that’s how relaxed and intimate his style was. It’s thanks to Mr. Peary that I’ve seen just about 90% of the movies he reviewed in those three books. And I will always be indebted to Mr. Peary as well as Roger Ebert for educating and influencing me in my own reviews. It’s thanks to the two of them that I stopped regarding movies as just passive entertainment and really started to pay attention as to why I liked certain movies, genres, actors and directors and what went into the craft and art of movie making. And if you’re any kind of movie fan at all you will make it your mission to find and read the three “Cult Movies” books. Trust me; you’ll never watch movies the same way again after reading them. So as the years went on, slowly but surely I’ve been able to check off most of the movies in those three books. With the advent of DVDs and now Netflix, I’ve been able to whack away at that list as a lot of movies were unavailable on DVD and previous to that on VHS. And one of those movies was CHILLY SCENES OF WINTER. For some reason, this movie eluded me for years. I could never find it on VHS. And as far as I know it was never shown on broadcast TV. I figured that once I had cable it would show up there, but nope. Never did. It never aired on the Independent Film Channel and they showed all kinds of obscure movies. Hell, it never even aired on Tuner Classic Movies and TCM has aired the full length “Heaven’s Gate”…what am I saying, TCM has aired “The Apple” for cry yi’s sake. But they’ve never aired CHILLY SCENES OF WINTER which made me want to see it all the more. What was it about this movie that I couldn’t get to see it noway nohow? Well, now we have Netflix and thanks to that I was finally able to see what it was all about for myself. And I understand. 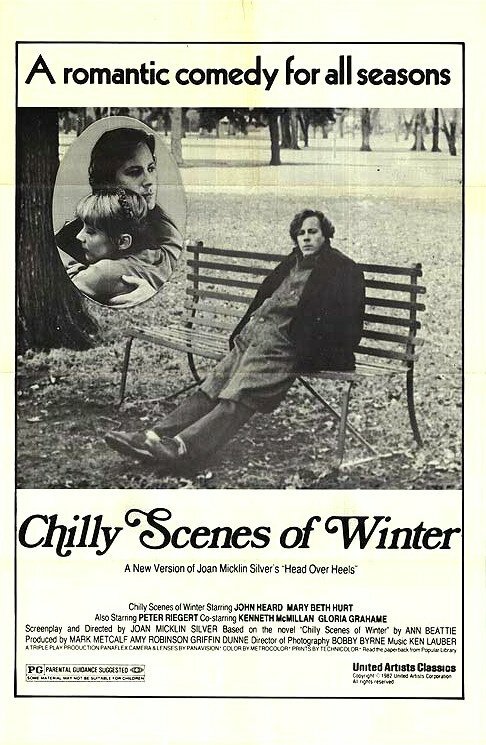 Nobody knew what to make of CHILLY SCENES OF WINTER back when it was released in 1979. The story goes that the studio thought it was too depressing and hated the title. It was released as “Head Over Heels” with a brighter, more cheerful ending and flopped. The movie was re-released with its original title and ending and did much better business. And having seen the movie for myself I can understand why. The relationship at the heart of CHILLY SCENES OF WINTER is doomed from the start. The other characters in the movie know it. I knew it ten minutes into the movie. If you elect to watch you, you’ll know it as well. The only ones who blissfully don’t know it is the man and woman involved. They don’t deserve a happy ending and they don’t get one. But what they do get is an honest ending. And sometimes that’s the only one we can hope for or expect from this life. Charles (John Heard) works in the Salt Lake City Department of Development where he writes reports all day long. He has no idea where his reports go after he finishes with them or what purpose they serve but since he’s had two recent promotions, he really doesn’t care. One day he runs into Laura (Mary Beth Hurt) who works in the filing department. He’s immediately smitten and asks her out on a date. She informs him she’s married but separated. And later that night he ends up at her new apartment. Now get your minds out of the gutter. It don’t go down like that. Charles is a hopeless romantic and doesn’t want a meaningless cheap affair. He wants to marry Laura and make her happy. Good luck. Laura is the type who isn’t happy now, probably wasn’t happy in the past and in fact, there’s a better than average chance she’ll never be happy, period. Laura has a long list of things she doesn’t want but ask her what she does want and she’ll give you that deer-in-the-headlights look. It isn’t long before Laura has moved in with Charles. And things seem to be going fine with the two of them until one day Laura just ups and goes back to her husband. Charles is not only heartbroken he goes a little bit nuts. He has conversations in his car with an imaginary Laura. He builds a model of her house, complete with miniature furniture. He parks his car on her street and sits there for hours, just looking at her house, chain smoking cigarettes while watching her and her husband through the window. Yeah, this sounds pretty creepy, right? And if it was played completely straight, it would be. But there is a remarkable amount of humor in the movie. It’s labeled as a ‘romantic comedy’ but it’s so totally unlike the cookie cutter romcoms infesting our theaters today. The humor comes naturally and unforced from the quirky personalities of the characters. And Charles is definitely quirky. I like how it is never once mentioned that he has a drinking problem but in just about every scene that takes place in his house, Charles always has a pint of vodka within reach and he keeps a bottle in his drawer at work. He has to deal with a suicidal mother (Gloria Grahame) and his jobless best friend Sam (Peter Riegert) who acts as a one-man Greek chorus, commenting on his friend’s obsessive relationship with a wonderful deadpan delivery. I like how the script doesn’t take the easy way out and makes Laura’s husband a monster or a sadist. In fact, he’s a pretty nice guy, making a good living and raising his daughter from a previous marriage. It’s Laura who has the problem because it’s Laura who has no idea what it is she wants from life or from a relationship. So should you see CHILLY SCENES OF WINTER? Definitely yes. It’s nothing like what passes as a romantic comedy these days. It’s a movie about people who have lives that started before we eavesdropped on this particular winter in their lives and at the end of the movie, I felt as if those lives were continuing on. Not a feel good date movie and not for those of you who need an explosion or a ninja vs. pirate fight every five minutes. But it’s most definitely something different and worth watching. Love the review. I never heard of this movie before. Will have to give it a shot. Never heard of this movie but it reads right up my alley. Great review, btw. Saw this when it first came out at an “Art” Cinema. The title was still “Head Over Heals”.